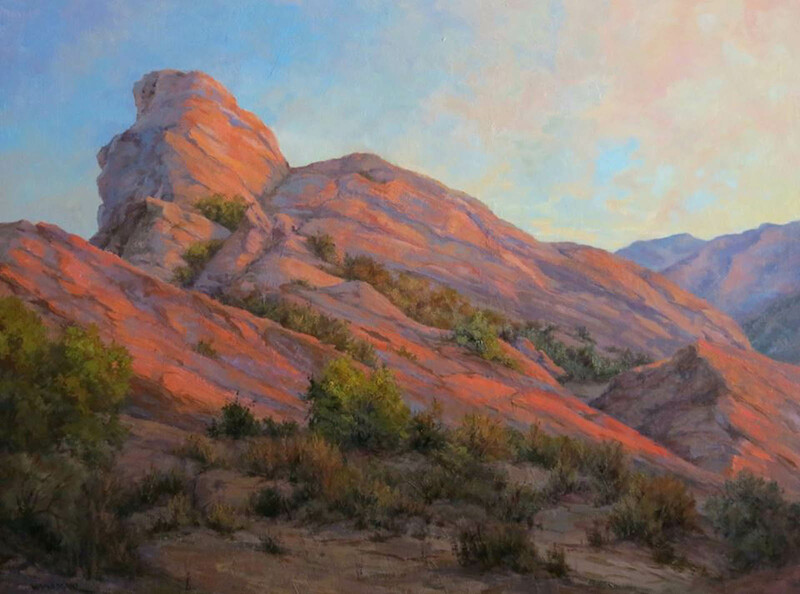 "Sunset at Vasquez Rocks," oil on canvas by Santa Clarita artist Laura Wambsgans. Sen. Steve Knight with Wambsgans' artwork, showing scale. The piece was created in 2013 at the request of state Sen. Steve Knight, R-Antelope Valley, especially for the 2013-14 California Contemporary Art Collection in Sacramento, where it was put on display. "The location was one that I have painted many times, and I jumped at the chance to paint the rocks," Wambsgans said. 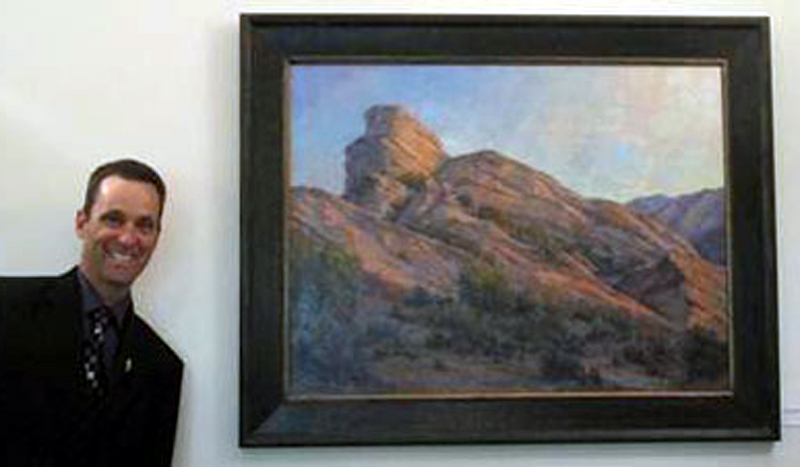 "Vasquez Rocks is a challenge to paint and magical all at once. I could paint within the park boundaries for years and never feel a lack of inspiration." On site (en plein air), Wambsgans said she paints small sketches and brings them back to her studio to create large paintings. "Painting out of doors, I am able really to see the effects of the sun on the landscape and capture the emotion of the location," she said. "Painting at Vasquez Rocks, you can almost feel the history held within the strange and wondrous formations." Said Knight: "Ms. Wambsgans work is magnificent, and I'm very proud to promote the talent that we have in our community." Born in Pasadena, Laura Wambsgans says painting has become her life's journey after working as a managing director of a major recording studio and then as a sculptor for two decades. Oil painting in a representational style, influenced by the Impressionists, Laura captures the effect of light on the land, though color and paint quality. Since 1986, Wambsgans' work has been exhibited nationally in solo and group exhibitions, including the Riverside Museum, Bakersfield Museum, Lancaster Museum and the Huntington Library. 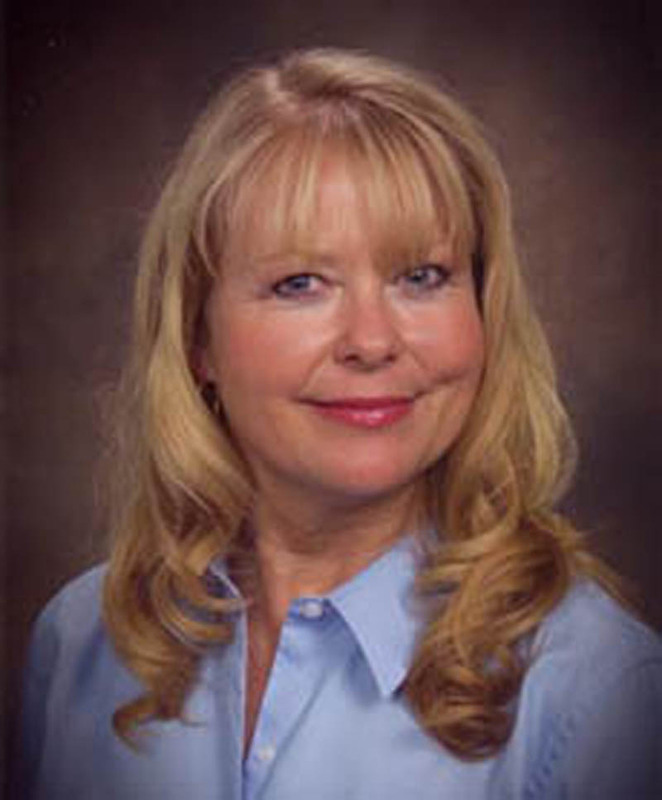 In 2006 Laura spearheaded "Chasing Open Spaces," an environmental project painting the open spaces of the Santa Clarita Valley. Laura has won numerous awards including the David Spalding Landscape award at the 85th annual Pasadena Society Of Artists Exhibit, 2010, Honorable Mention at the 87th Annual Pasadena Society of Artists Exhibit , 2012, Bakersfield Museum Juried small works exhibit Honorable Mention 2006 and since 1990 she won 14 awards at the Santa Clarita Art Classic annual event, elevating her to Master status. The California State Senate's Contemporary Art Collection program, begun in 1997, recognizes and celebrates contemporary art created by the wide variety of artists throughout the state. Every other year, each senator is asked to select an artist who he or she feels best represents his or her district. In the past, they have been selected through school programs, senior centers, art galleries and county art programs and arts councils. The result is a joint effort between the participating senators and their artist. These artists bring to the Capitol an extensive range of cultures, backgrounds and training. The media with which they work is also as varied-acrylics, oils, bronze sculpture, blown glass, mixed media and watercolors. The talented, diverse and colorful selection seen at each show is a testament to the fact that contemporary art is alive and well in California.